For a link to our new study in BMJ, with free access to the full text, click here. This blog was adapted from my LA Times op-ed published today, linked here. And for a science section article about our study in NY Times, clinic here. Most people have trouble staying on a weight-loss program. Of those who stay on a program, most don’t lose much weight. Of those who do lose weight, most regain it in 1 or 2 years. These observations, first made in the 1950s, remain true today. It’s time to question every assumption. The conventional approach to obesity considers weight control a matter of accounting — too many calories into the body, not enough calories out. The solution: count calories, eat less and move more. Make sure you have a negative “energy balance” and you’ll eventually solve the problem. Sounds simple. The problem is, calorie restriction is devilishly difficult for most people over the long term, because the body fights back against calorie deprivation. Decades of research show that, with weight loss, hunger inevitably increases and metabolism slows down. The more weight you lose, the harder it gets to burn off those extra calories, even as hunger and cravings for extra calories keep rising. This isn’t a matter of will power. In the battle between mind and metabolism, metabolism wins. According to nationally-representative data, fewer than 1 in 5 people with overweight or obesity have ever lost just 10% of their weight, for just 1 year. We each have sort of set-point, a weight that our body seems to want to be — lighter for some, heavier for others, determined in part by our genes. Some people can eat whatever they want and stay thin. Others seem to gain a few pounds simply walking by a bakery. For both groups, attempts to either lose or gain significant amounts of weight run into biological resistance. But if our biology controls body weight, why does the average person in the US weigh 25 or 30 pounds more today than 40 years ago? Our genes haven’t changed. What’s pushing body weight set-point up, year after year? The conventional Energy Balance view of obesity offers no compelling explanation. After all, humans have lived for long periods of time with an abundance of food — such as from the end of World War II until the 1970s in the US, the 1980s in Europe, and the 1990s in Japan — without inevitable weight gain. Something has caused the body of a typical person to fight to maintain a much higher weight today than was previously the case. Have We Had it Backwards? The Carbohydrate-Insulin Model (CIM) of obesity argues we’ve had it backwards all along. Overeating doesn’t cause weight gain, not over the long term; the process of gaining weight causes us to overeat. According to the CIM (see Figure 1), the processed, high-“glycemic load” carbohydrates (mainly refined grains, potato products and added sugar) that flooded the food supply during the low-fat diet craze of the last 40 years have raised insulin levels, forcing fat cells into calorie storage overdrive. Our rapidly growing fat cells take up too many calories, leaving too few for the rest of the body. That’s why we get hungry. And that’s why metabolism slows down if we force ourselves to eat less. 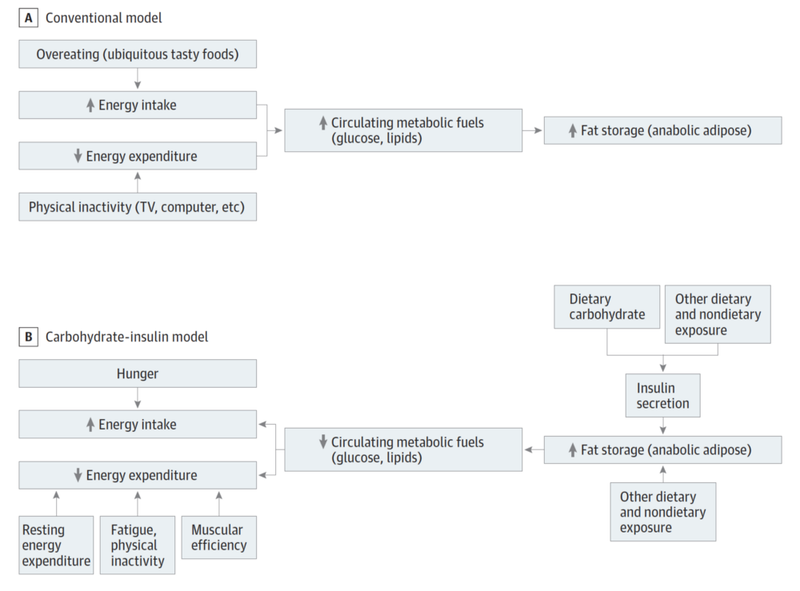 FIGURE 1: The Conventional “Energy Balance” Model and the Carbohydrate-Insulin Model of Obesity. Notice that the arrows flow from LEFT TO RIGHT in Panel A and from RIGHT TO LEFT in Panel B (in JAMA Internal Medicine 2018 ;178:1098–1103). The CIM is supported by many lines of research, as previously summarized. Encouragingly, the CIM offers an entirely different approach to weight loss that works with, not against, the body to achieve better long-term results. So why isn’t the CIM embraced by the scientific community and used in the weight loss clinic? 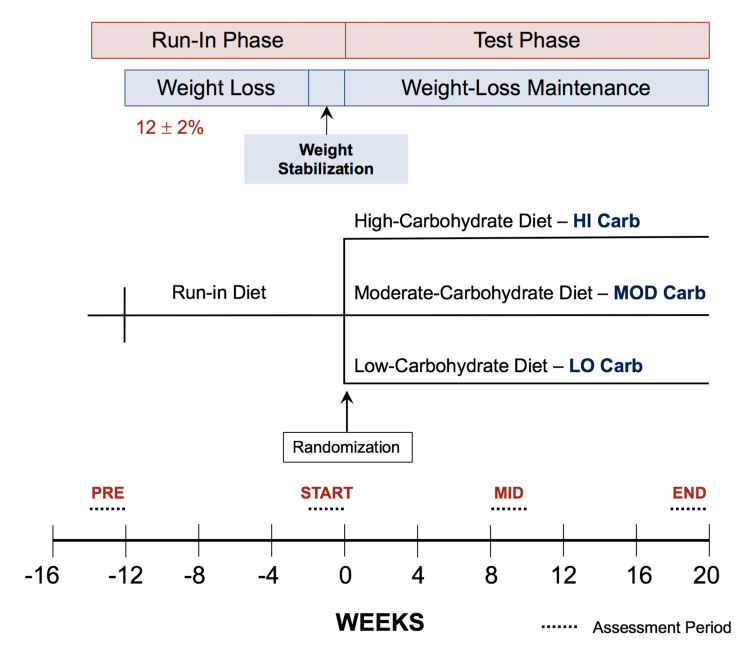 In large part because feeding studies (in which research participants are carefully studied on controlled diets) have not shown the expected advantage of low-carbohydrate diets for metabolism. But these studies have a serious flaw — they’ve been much too short to provide a fair and rigorous test. We know that the process of adapting to a low-carbohydrate diet takes a few weeks. There’s even a name for this experience: the Keto Flu. After cutting back carbohydrates, you’re apt to feel tired and a bit spacey until your metabolism adapts to using fat (and ketones, derived from fat) instead of glucose as the primary fuel. Unfortunately, most feeding studies last just a few days — long before adaptation has had a chance to occur. Imagine a study in which habitually sedentary people were put on an intensive physical training program, with many hours a day of vigorous running, calisthenics, and sports. After a few days, the subjects would probably feel tired, sore and weak. But the investigators shouldn’t conclude that physical training was bad for health, just that the potential benefits require longer study. Before passing judgement on the CIM, we need longer, larger feeding studies. But these studies are expensive. It’s commonplace for the pharmaceutical industry to sponsor drug studies costing well over $100 million, but you could probably count on one hand diet studies in that price range. Short-sightedly, government support for nutrition research is a tiny fraction of a cent per dollar spent in medical costs for diet-related diseases. Fortunately, philanthropy has begun to fill the gap. With support from Nutrition Science Initiative (NuSI, made possible by the Laura and John Arnold Foundation and others), and by the New Balance Foundation, we conducted one of the largest, longest feeding studies in the modern nutrition research era. In a novel collaboration with Framingham State University and their food service, Dr. Cara Ebbeling, our co-investigators and I recruited 164 students, faculty, staff and community members who agreed to consume only study foods for a full academic year. Throughout this time, we adjusted calorie intake to keep the participants at their START weight. So if someone’s metabolism speeded up and they began to lose weight, we would have provided extra calories. If another person’s metabolism slowed down causing weight gain, we would have cut back calories. By preventing weight change, we could then see how metabolism changed as a direct response to dietary composition. These calorie adjustments did the job. Through the 20-week Test Phase, average weight remained within 2 kilograms for most participants. However, even through participants in the 3 Test Diet groups had the same average weight, metabolism differed remarkably (see Figure 3). Total energy expenditure was about 250 calories a day greater on the low- compared to the high-carbohydrate diet. Without intervention (that is, without adjusting calorie intake as we did to prevent weight change), this increase in metabolism would produce substantial weight loss — about 20 pounds after a few years. . . . with no change in calorie intake. If a low-carbohydrate diet also decreased hunger and food intake (as other studies suggest), the effects could be even greater. FIGURE 3: Change in Total Energy Expenditure on the Low (LO), Moderate (MOD) and High (HI) Carbohydrate Test Diets. Intention-to-Treat (Left) includes all 164 participants. Per Protocol (Right) includes 120 participants who remained within the target weight of +/- 2 kg. 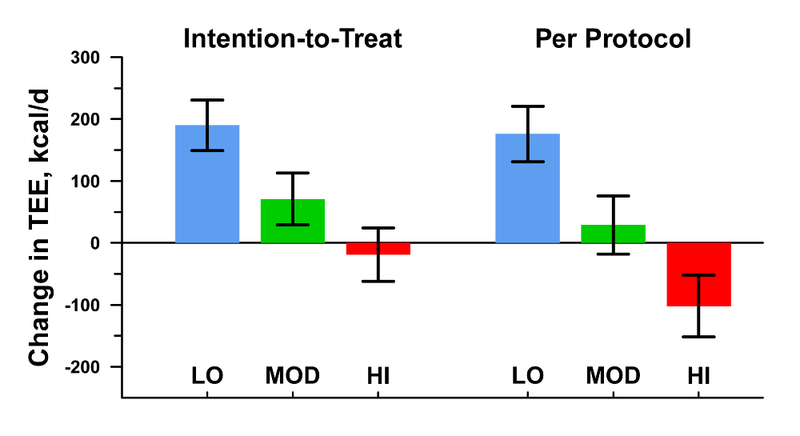 Overall diet effects, P≤0.002. So, the type of calories consumed affect the number of calories burned, challenging the long-standing dogma that all calories are alike to the body. Of course, no single study can ever answer all questions about diet and obesity, and every study has limitations. Ours has three. First, since we couldn’t lock up participants in a hospital ward for an entire academic year, it’s possible that they didn’t fully comply with the prescribed diets. Some may not have consumed everything provided, or they might have eaten non-study foods unbeknownst to us. However, we conducted “sensitivity analysis” to show that the primary results would remain significant, even with high levels of non-compliance. And the third issue is “generalizability.” We provided participants with scientific diets; they didn’t prepare their own foods. So we don’t know what would happen in a real world setting, or with a more diverse population. However, for each of the Test Diets, the meals were based on real foods, not liquid formulas, prepared by a commercial college food service — increasing the likelihood that our findings could be applied to the weight loss clinic and to public health. Determine whether ketogenic diets that severely restrict carbohydrate offer advantages beyond more moderate regimens (i.e., that allow for some whole fruits, legumes, whole kernel grains, root vegetables and perhaps a touch of added sugar). In conclusion, our study cannot “prove” the CIM is true. But the findings demonstrate that recent claims to have “falsified” this alternative way of thinking are premature at best. A credible case can now be made that all calories are not alike to the body, and that novel effects of food might make a big difference in the long-term success of weight loss treatment. With the latest data indicating continuing upwards trends of obesity in children and adults, we all need to keep an open mind for new ways to address this international health crisis.